This indeed is the authentic measure of the late president’s achievements: there is now no simple switch in Venezuelan public ideology – no going back. The turn in the post-colonial history of the region is unequivocal. Supporters of the late President Hugo Chávez. Demotix/Jesus Gil. All rights reserved. A slogan, now infamous, was daubed on the walls of Buenos Aires in July 1952 to mark the imminence of Evita Perón’s death. Viva el cáncer (long live cancer), the graffiti declared. The atrocious sentiment has not surfaced much in Venezuela in the long lead-up to President Hugo Chávez’s death on Tuesday, but it is safe to assume that opponents who essayed a coup and a general strike as well as innumerable protests, campaigns and candidacies aimed at bringing down the late leader may have harboured the thought. It is a revealing remark. On one side, we have the typical excrescence of reactionary Latin American politics, harking back to the Cold War benchmark of US support for anti-communist national elites. And on the other, we have a US ambassador that we may assume was not greatly fond of Chávez, nor his inflammatory rhetoric, but who in the style of President Obama was worldly enough to recognize that the Bolivarian was no extremist distortion, but an integral part of his society’s history and expectations. This indeed is the authentic measure of the late president’s achievements, the reason he was rightly praised by Brazil’s Dilma Rousseff on Tuesday evening as a “great Latin American”: there is now no simple switch in Venezuelan public ideology – no going back. The turn in the post-colonial history of the region is unequivocal. Until Chávez and his cohort in Ecuador, Bolivia and elsewhere took power through the ballot box, every period of revolutionary or radical, progressive government in Latin America was reversed at the moment of its fall, often with the aid of military-led violence. The pattern can be found in Guatemala in 1954, Chile in 1973, Argentina in 1976 or Nicaragua in 1990; elsewhere, the radicals were not ever allowed close to power. This is the case of Colombia in 1948 (the Bogotazo), described by Eric Hobsbawm as “an abortion of a classic social revolution” for which the country, still one of Latin America’s most violent, continues to pay the price. In several of these cases, the radical forces that were stripped of power had not excelled in government. There were instances of political naivety, or, as the Sandinistas in Nicaragua proved, galloping corruption; the (hardly progressive) government of Isabelita Perón that was usurped by the Argentine military set a high bar for ruling incompetence. Similar charges can be laid at the feet of Chávez. For years, the Venezuelan opposition and its myriad sympathisers have berated with good cause economic mismanagement, corruption, spiralling crime rates, misuse of power, dubious foreign friends and meddling in the judiciary; the latest devaluation of the national currency, the Bolívar, is an augury of a fiscal and monetary restructuring that will cause deep pain for the country’s post-Chávez rulers and population. Raúl Baduel was one very knowledgeable critic who I interviewed in Caracas in 2008, one year after he left his post as defence minister. His summation of “socialism in the 21st century” has stood out as the neatest encapsulation of the opposition’s swarm of valid criticisms and fevered resentments. “The repetition of basic slogans empty of content, which was aimed at sustaining nothing but the personal ambition of President Chávez to become life president of a Venezuela that grows ever poorer.” Wrong in at least one respect: Chavez has passed away. Baduel, meanwhile, has been in a military jail since 2009, accused of fraud. Many other commentators, in all manner of outlets, have rehearsed and reiterated the late president’s virtues and vices. They will continue to do so, and one senses that these disputes will evolve into a continuous matter for historical inspection. But there remains something fundamentally amiss in the argument, a misreading of Venezuelan politics that assumes Chávez to have been either a deranged paratrooper, or, in the eye of his supporters, a charismatic visionary wearing the mantle of Bolívar and Ché Guevara, when in fact he was a perfect outgrowth of his time and place. And his faults in government, which cannot be denied, were as much the results of these initial conditions as they were effects of his strategic masterwork. Throughout his career, from his inception as a clandestine military conspirator in the 1980s, to his emergence as coup leader, political mobilizer and presidential candidate in the 1990s, and finally to his enthronement as elected and re-elected president, two elements of Venezuelan public life shaped his acquisition and use of power. These were the utter corrosion of the party duopoly that had run the country since 1958, and which had converted formal office into a façade for handing out spoils and oil revenues; and the magnification of social and political polarization through income differentials and an apparatus of social segregation, whose consequences were first displayed to the world via the Caracas riots of 1989. Throughout his presidency, but particularly after his referendum victory in 2004, Chávez ruled through informal channels, as his predecessors had done, and harnessed the tremendous social polarization that festered in the 1990s, forming an extraordinary emotive connective tissue with the low-income majority. There are many good reasons to condemn Chávez’s rule. But there is no erasing the first sights I had of Caracas in 1993, where small huts clung to eroding hills while the national press ran pages and pages of photos from what were supposed to be philanthropic cocktail evenings. From this soil, Chávez proved exceptionally adept at agglomerating groups, forming coalitions, scenting opportunity and building a tremendous and durable power bloc; helped all the while by soaring oil prices. His skills as president were great, though not infallible: he needed the outrage of the urban poor to save him from the coup of 2002, and he certainly required a dose of enforced moderation to recover from his vainglory of 2007, when he pursued the “corpse” of President Bush up and down Latin America and lectured Venezuela’s National Assembly for six hours on the need to redraft the Constitution in ways that best suited him. He lost the ensuing referendum, his only clear defeat at the polls. Without him, the chavista regime will face stiff challenges, not helped by the strong possibility of factional disputes unresolvable through their Leviathan. A coherent plan was laid out by Chávez ahead of his final duel with cancer: a civil and military compact at the heart of a new geometry of chavismo. This would combine a civilian political centre, doubtless fought over by interim President Nicolás Maduro and the speaker of the Assembly Diosdado Cabello, and a string of regional bosses allied to the military establishment: 11 of the 23 state governors are now former officers. But amid economic stresses, factional infighting and the presence of various armed militia, the stability of this equation remains in some doubt. However, these are matters for the coming weeks and months. They shadow any conclusions as to Chávez’s record, make any attempt at establishing his achievements provisional at best. 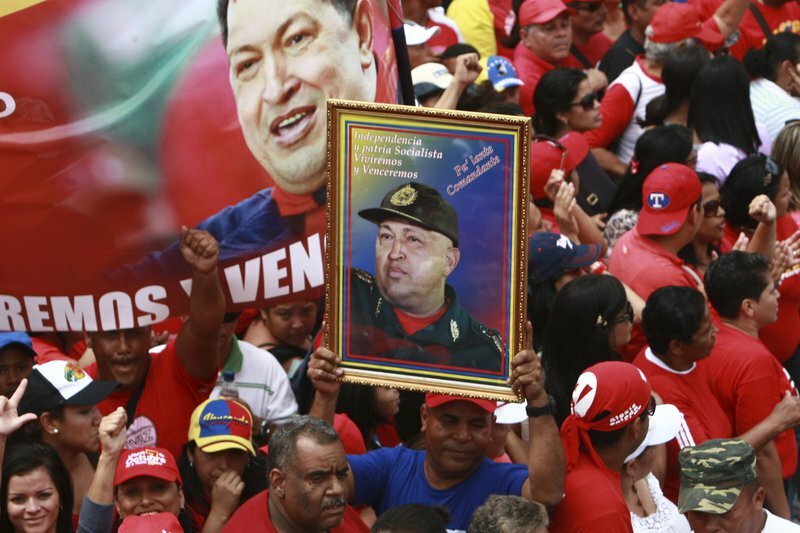 Yet at the risk of entering an early verdict that is abruptly overturned, it would seem there are three aspects of the Chávez years that can be counted as a legacy. The first derives from his own egalitarian and levelling ambitions. If we take the latest Social Panorama of Latin America, published by the UN Economic Commission for Latin America and the Caribbean (known in Spanish as CEPAL), we find possibly the most reliable evidence of Venezuela’s social progress: poverty rates fell from 49.4 per cent in 1999, when Chávez took power, to 29.5 per cent in 2011. Venezuela, the report adds, is the most egalitarian country of 18 nations in Latin America, and has the third lowest perception of unfairness in income distribution. Furthermore, polls provided from Latinobarómetro have long shown that Venezuelans are amongst the most satisfied with democracy in the entire region. These are impressive statistics, but should be qualified. Obviously, the resources to achieve such progress have come from an economy that is more oil-dependent than ever. They also fail to take into account the country’s colossal crime and murder rates, and their corrosive effects on social capital. Lastly, and most importantly, they also mirror achievements across the region as a whole: a World Bank study from last year indicated that Latin America’s middle classes have grown by 50 million over the last decade, while poverty rates as a whole have fallen from a high point of 44 per cent in 2002 to 29 per cent in 2012. Thus, far from making an exceptional contribution to social welfare, the late president appears to have formed part of a broader phenomenon in which he is condemned to share plaudits with the centre-left in Brazil, or the right in Colombia and Panama. His outstanding achievements in reducing inequality may in turn owe much to the steady emigration of upper and middle classes: 244,000 Venezuelan were registered as living in the United States last year. A little more confidence can be attached to Chávez’s efforts to rebalance relations between his country, Latin America and the rest of the world. His contribution to processes of regional integration, though not always consistent, was crucial, not least in the creation of UNASUR and the Community of Latin American and Caribbean States (CELAC). His military spending (an estimated 11 billion US dollars to Russia from 2004 to 2011), his anti-imperial harangues and his friendships with assorted tyrants were perhaps not to everybody’s taste, but they successfully worked as decoys for the new independent diplomacy of Brazil, and created the sort of geopolitical atmosphere in which Latin American countries for the first time ever could demand a new global regulation of drugs. At least until 2011, his was never a quiet or exhausted presidency. Such energy served a crucial role in reanimating publics left without purpose or resources in the neo-liberal winter of the early 2000s. But it was the manner in which he did this which will survive as a second legacy: far from allowing differences and divisions to be naturalized as part of the unbreakable social order, the norm throughout Latin American history, he dramatized them, flavoured them for his audience (“we are the rabble who followed Bolívar”, protesting students were “daddy’s little kids” etc. ), and then made points for political action. This struck many in and outside Latin America as deeply offensive: one only need think of The Economist’s praise in 2010 of the new British prime minister and his deputy to sense how many in the world’s metropolitan elites have reacted to such diatribes (both were “well-adjusted human beings. You search in vain on both men’s shoulders for the chips that typically burden and motivate politicians”). Exceptionally chippy though he was, Chávez was not the first to name inequality; but he was the first post-Cold War democrat to make systematic use of it. And so long as the issue is alight in Latin America’s public consciousness, it remains more probable that the continent’s inequities will remain free of government neglect. His last legacy, however, is less certain to garner praise. Chávez’s weak spot is the one that has plagued almost every Latin American revolutionary, and which for now, judging from experiences in Argentina, Bolivia, Ecuador or Nicaragua, remains ineradicable. At root, the changes Chávez established were not of systems but of personnel; those who were poor, mestizo or excluded have entered power, but in the process have not managed to change the way power works, nor the circuits of patronage and dependence it relies upon. They have simply become the new oligarchs: the boli-bourgeoisie. In this respect, it spoke volumes that the great dame of Mexican trade union politics, Elba Ester Gordillo, who was born into dire straits in Chiapas and donated a kidney to her dying husband at the age of 20, was arrested late last week for embezzling over 150 million US dollars. 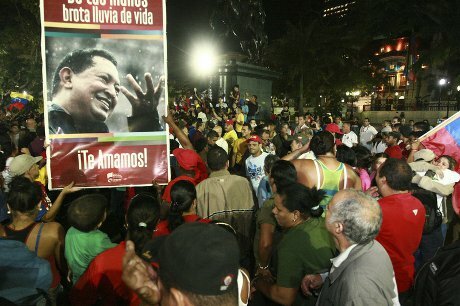 Crowds at Bolívar Plaza in Caracas mourn Hugo Chávez. Demotix/Jesus Gil. All rights reserved. From what we know, Chávez had no interest in his own economic fortune. His family and allies, however, certainly did. Whether they will follow the radical pursuits of the pioneer or settle back into oil-fed inanition is unclear. Chávez has gifted a style and method of government that is now part of Latin America’s democratic furnishings, but he can only reprimand his colleagues in the language of dreams.